Earn 350 loyalty points when you order this item. The Naim FraimLite (available on 0% finance when you spend over £500) add-on levels combine with the Naim FraimLite Base to complete the Naim FraimLite Hi-Fi Rack. The FraimLite comes in three sizes to accomodate varying sizes of equipment - standard (115mm height), medium (190mm height) and tall (264mm height). The Naim FraimLite Hi-Fi Rack is the entry-level model in the Fraim range and provides the perfect equipment support system for Naim and other hi-fi equipment. A stripped back version of Naim's reference Fraim, FraimLite operates on the same principles, providing a rigid, self-levelling platform for supported hi-fi equipment that isolates hi-fi separates from each other and their environment. Its simplified design results in a more affordable and simpler-to-set-up equipment support system that still looks stunning in a modern domestic listening room. The price shown is for a Naim FraimLite Shelf Unit only. These shelves are available in heights of "standard" at 115mm, "medium" at 190mm and "tall" at 264mm. 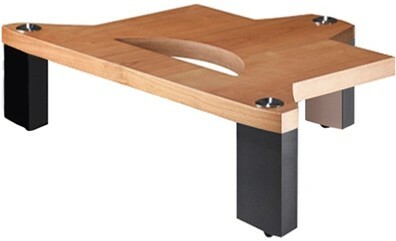 Naim FraimLite bases are available for a full stand as pictured - please contact us for a quote. The FraimLite wood is available in 3 different real wood veneer finishes: Cherry, Maple and Black Ash. The FraimLite Legs are available in either Black or Silver (natural anodised aluminium). The FraimLite uses the same high-calibre materials, minimal contact cone and cup interfaces and floor spikes as the Fraim. The FraimLite forgoes the glass sub-shelf and ball bearing decouplers of the Fraim and has only a single base layer. This accounts for the difference in performance between the two models and has the advantage of making FraimLite more cost effective and even easier to transport and assemble. As with the Fraim, the spacing between levels is designed to minimise magnetic field interactions between the equipment, and non-ferrous materials have been used wherever possible to further reduce magnetic effects.